Part of the Christmas story can be found in the book of Matthew, the first book in the New Testament. There, in chapter two, we read of several wise men, Magi, who followed the star till it rested over the place where the young Jesus was living. But what most people fail to notice is that only the shepherds came to visit Jesus while he was still a baby in a manger. The Magi came later, once they were living “in the house” and Jesus was a “young child.” And, based on Herod’s decree that all male children 2 years old and younger should be killed (Matt. 2:16), Jesus could have been a toddler up and walking. When the Magi came to Bethlehem in search of “he that is born King of the Jews” (Matt. 2:2), they brought with them three very rare and valuable gifts: gold, frankincense, and myrrh. They were not random gifts, but ones with specific political, spiritual, and practical importance; they were meant to recognize a literal, earthly, but also heavenly King. Gold was a universally recognized precious metal, symbolic of all wealth. 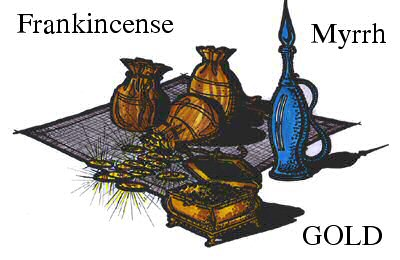 Frankincense was a substance primarily used as incense, but also mixed with other substances to create the holy anointing oil placed on high priests and kings. Myrrh was a substance used for things ranging all the way from cosmetics and antiseptics, to perfuming the living and embalming the dead. According to Matthew 2:11, the Magi fell down before Jesus, which would have been an appropriate response when in the presence of royalty (and these men knew the difference). But the wise men did more than fall prostrate before royalty, they “worshiped him.” This young king was more than just “King of the Jews,” but the long-promised Messiah, and they offered their gift to the Son of God. As long as I can remember there have been sermons preached during and before Christmas entitled, “Wise Men Still Seek Him.” The sermons focus primarily on the seeking leading up to Christmas, but rarely, if ever, on the gifts given after the celebration is over. But today is different. Today, I am going to ask you to consider three gifts we should give, now that the birthday celebration is over. Gold. Gold represented wealth. In your worship of the King, will you give Him your wealth? In reality, God owns everything, including everything He loans unto you. But with your heart, are you willing to lay everything that is most valuable to you at His feet? Frankincense. Frankincense represented worship. Would you be willing to fall down before Jesus, or do you hold back some of your Frankincense in reserve? Are there idols in your life – people or things – for which you reserve a little of that anointing oil, making those things lords of your life? Would you be willing to make Jesus Lord of all? Will you worship him without reservation? Myrrh. Myrrh was symbolic of the beauty of life, from beginning to end. Would you give to Jesus everything that makes you happy? Everything that brings you hope? Everything that is sweet-smelling? Everything that hides your faults and failures, disguising your true self? Would you give Jesus your life? He can do more with it than you can do on your own. For several days after Christmas people will stand in line to return and/or exchange unwanted gifts. Many will trade what others gave them for something they want more. Others will just ask for a refund or in-store credit. Rest assured that when you give your gifts to Jesus, he will not return them, exchange them, or re-gift them next year. But will you, once you realize what you’ve given, want to take something back? Once you give Jesus those three gifts, you’ll never be the same. Don’t wait for a New Year’s resolution. Now that Christmas is over, be like the Magi and leave everything at Jesus’ feet, then “depart…another way.” Once you give Jesus those three gifts, you’ll never be the same. This is just some of the commentary and ignorance that I deal with on a daily basis. And it has made me see his world in a whole different light. Recently a friend of ours from church who has an autistic son gave me a book entitled, “Ten Things Every Child With Autism Wishes You Knew,” by Ellen Notbohm. I haven’t finished the book yet because I’ve stopped to pause and reflect on every page. The book is written from the perspective of the autistic child which is wholly unique. And although of course it can’t capture everything that child may be thinking or feeling, it is a valiant attempt at getting people to understand how that child feels. I wasn’t even a couple of pages into the book when I thought about a recent series of questions I was asked about being a Jewish believer in Christ. These questions can oftentimes feel like science experiments, making me feel different and not so good about myself. Gentile brethren are oftentimes misguided and uninformed, asserting their theological opinions on who I am and what my journey to Christ may or may not look like. If I didn’t hold back, I’d want to shout from the rooftops, I am just like you! I am a Christian too!!! Why must you see me any different? Reading the beginning of the book, the quick overview of the ten things that every child with autism wishes you knew, immediately sparked an idea in me to express to people the 10 things Jewish believers in Christ want you to know. Jewish believers are often polite and not forthcoming about their struggles, and I am hoping that by revealing some of my innermost thoughts, gentile brethren will understand where I am coming from as Jewish follower of Christ. 1. Please don’t expect that I know everything about the Jewish religion- Most Jews don’t. We as Jews are oftentimes more cultural than we are religious. Being Jewish is part of our identity just as if someone was Hispanic. But this does not mean that we speak Hebrew, know the Old Testament or can recite an entire Passover Seder. There’s nothing worse than being called on or questioned about our Judaism in front of other believers. 2. Please don’t tell me I am no longer Jewish- Jewish people have a heritage and identity that resides deep within their souls. We bleed Jewish. When we as Jewish women are pregnant, we are tested for Jewish specific diseases based on our ancestral heritage. Jesus was JEWISH. Jesus did not stop being Jewish when he was crucified and died, so neither do I. And please do not cite your authority for believing I am no longer Jewish as Galatians 3:28, you are misguided. Respect my heritage and who I am. Yes we are one body in Christ but I cannot change WHO I am. Being Jewish is part of who God made me and part of my identity. 3. Please don’t single me out amongst our brothers and sisters- There is nothing worse than having your well-meaning Christian brother or sister introduce you as a Jewish believer. If it comes up in conversation fine. But please don’t shout across the room and draw attention to me. I want to be just like you, a Christian. I am saved and redeemed by the blood of the lamb just like you. 4. Don’t expect that I know other Jewish believers- This happens all the time, I expect because we are somewhat of an anomaly. Hey do you know Sally Jones, she is also a Jewish believer. No, no I don’t know Sally Jones. Why would I know Sally Jones? We are no longer living in the desert in close communion with one another. There are millions of us. Don’t expect me to know Sally. 5. Don’t put us down because we choose to keep our customs and traditions alive; this is not legalism!- Jewish custom and tradition is inherent for us. We are rooted in the foods and holidays of our Jewish culture, and guess what, so was Jesus! People want to make Jesus a gentile, but he is not. He celebrated all of the Jewish festivals and grew up Jewish. Hello, the last supper was a Passover Seder! For many of us, these traditions bring us closer to Jesus and help our children understand who they are in Christ. 6. No we have not all been to Israel- I am American just like so many of you. I have not been to Israel. Although I hope and pray that God will grant me that trip one day, I’ve never been as I am sure most of you haven’t either. 7. Stop telling me that my Jewish relatives will never make it to heaven unless they accept Jesus- You don’t know that and you don’t know whether someone has accepted Jesus as their Lord and Savior. Jewish people are shunned once they become Christians and many may not outwardly profess Christ, but you never know what’s in someone’s heart. 8. Be sensitive to the fact that I am new to Christmas and Easter- Three years ago was our first Christmas and Easter. It was hard for us to figure out how to celebrate and what to do. We have no traditions or family meals since we are Jewish. Do the Christian thing-invite us to yours, especially when you know we are new believers. Help us to develop our own traditions to pass on to our own children. 9. Love me for who I am and stop trying to make me a Gentile- I will never be a Gentile. Love me for me, just as you would love any believer for who they are in Christ. Respect where I am in my walk with Christ, and encourage me in that as a Jew, not a Gentile. 10. You as a Gentile will never know what it’s like to be Jewish- No amount of bible school will teach you that. Don’t try to be like me or try to use your biblical knowledge to show me that. I’ll respect you more for the person that God made you, not the knowledge you have. It is hard to be a Jewish believer in Christ. Friends and family will be sure to leave you. You are ostracized from your Jewish community and then many times inadvertently ostracized from your Christian one. We don’t fit in neatly, which is where you come in … to help us acclimate, to respect who we are, and to love us as Jewish believers in the Lord Jesus.